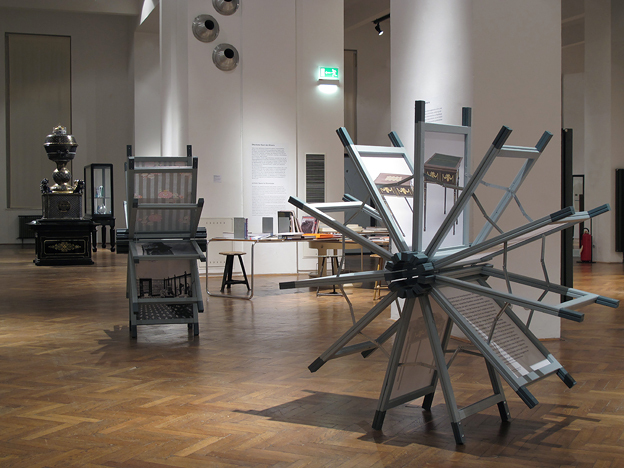 With its nine collecting areas, the MAK not only represents an enormous store of objects and information, but also bears witness to how processing techniques, materials research and concepts of both science and functional aesthetics undergo constant development and reflect society´s continual change. A history of transformation can be traced which crosses chronological, regional and geographic boundaries and manifests itself in all areas of aplied art, including the way such areas open up to other disciplines and fields of research. Krüger & Pardeller have developed a variable display which is set in motion simply by being observed.